What is Sulforaphane and in which foods does it occur? 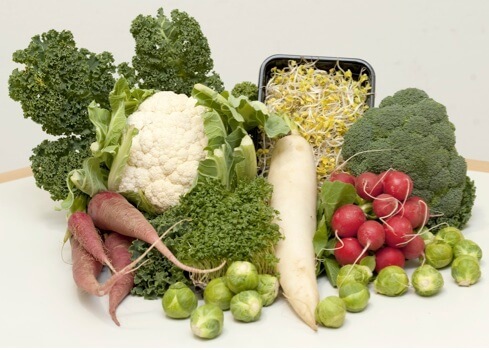 Sulforaphane is an ingredient, which is found in the family of cruciferous plants, and it is said since ancient times to have a salutary effect. Among cruciferous plants are broccoli, cauliflower as well as all types of cabbage, and watercress, nasturtium, arugula, radish, small radish, horseradish, rutabaga with turnip greens, canola and mustard. Meanwhile the active ingredients of these plants have been isolated: These are glucosinolates, of which more than 150 different are known and found in varying amounts in the various cruciferous vegetables. These account for the sharp taste of radish, horseradish and mustard or the partly bitter taste of various kinds of cabbage. One of the best known and most studied is the glucosinolates glucoraphan, which is cleaved into the active substance sulforaphane, which we applied in our studies.